The US Powerball jackpot is slowly inching its way towards the $300 million mark as the latest draw held on February 17 ended in yet another rollover. What was supposed to be a huge $225 million jackpot will now grow to an estimated $246 million jackpot for this coming Wednesday’s draw. The cash option, before any taxes, will be an estimated $146.4 million. While there weren’t any jackpot winners, there were a total of 827,892 winners of secondary prizes. Some of those secondary wins include 2 winners of the $1 million second prize—one from Florida, and another from Ohio. As for the third prize winners, there were 24 winners in total, with 4 of those winning with the Power Play activated. The Powerball winner who is fighting for her anonymity has just been allowed by the New Hampshire Lottery Commission to start receiving portions of her $560 million jackpot winnings. The lottery commission also stated in the motion filed last Thursday that the woman can employ a trust to receive the winnings on her behalf, so long as they present her winning ticket along with her photo ID and social security number, so officials can properly verify her claim. That being said, the court’s ruling will not be affected by this recent turn of events, so whether the woman can remain anonymous or not is still up in the air. The Mega Millions draw last Friday, February 16 ended in yet another rollover. This means that the previous $168 million jackpot will now increase come Tuesday, February 20. The payout? An estimated $185 million with a cash option worth $109 million. While nobody walked home with the jackpot, there were 3 lucky players who matched all 5 numbers—which means each would walk home with $1 million in tow. Overall, there were 210,846 players who won at least $4 each. 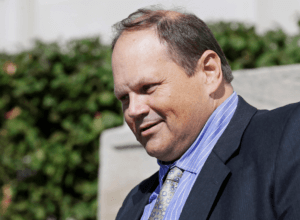 Eddie Tipton, one of the most infamous lottery scammers in recent years, rigged way more draws than authorities first thought. A former security director at the Multi-State Lottery Association (MUSL), Tipton embedded a self-destructing rootkit program inside lottery machines that would enable him and his cohorts to predict the winning numbers across 17 states. Investigators believed Tipton set up his code so that his defrauding activities would only fall on two specific days every year—November 23 and December 29. But now, an independent security audit by the MUSL uncovered new information that revealed just how far Tipton and his accomplices went. The audit discovered one more date hidden inside the rootkit program: May 27. While one date might not seem like much, this new information means that there is a high probability that there were way more potential lottery fraud cases that went undetected for nearly a decade. Good news! There is 1 confirmed winner of the £18,139,352 jackpot during the February 17 draw of the National Lottery Lotto. Meanwhile, there is also 1 confirmed winner of the £81,394 second prize. 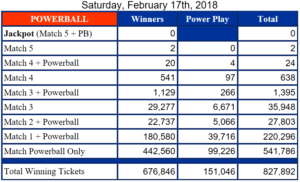 Overall, there were 1,525,512 winners during last Saturday’s draw. Another good news for National Lottery fans: one lucky player gets to take home the £500,000 UK Thunderball jackpot following the February 17 draw. Meanwhile, 2 players will take home £5,000 each for matching all 5 numbers, and 61 players will take home £250 each after matching all 4 numbers plus the Thunderball. Meanwhile, nobody won the grand prize of the Euromillions draw last Friday, February 16. The jackpot was worth £133,365,227 but will now rollover to an estimated £141 million come Tuesday, February 20. There were, however, a total of 5 winners (2 from the UK) of the second prize. Each will receive £224,264.80. Overall, there were 3,342,645 secondary prize winners.